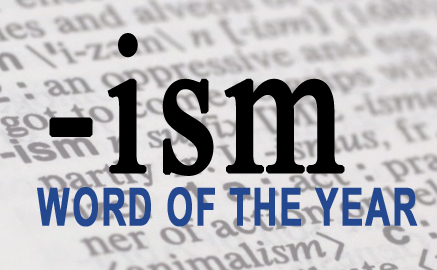 –ism isn’t actually a word you can use in a sentence or even start a sentence with (although I just did), but the Merriam Webster Word of the Year isn’t necessarily a word. Of course not. The Word of the Year is the “word” people most frequently look up at the m-w.com website. The list is quite telling, if not mildly frightening. Also hot on the Merriam-Webster market for 2015 was the word “hypocrite.” Hypocrite spiked when Josh Duggar was revealed to have been involved with Ashley Madison. Other people were looking up “hypocrite” in droves, while I was Googling Ashley Madison to see if it was a children’s clothing line or perhaps a brand of towels and bedding. I was wrong again on both counts, although Ashley Madison was closely linked to bedding but not in the way I had thought. If you’re still having –isms over a suffix being selected as Word of the Year, you should know that Oxford Dictionaries chose an emoji as Word of the Year. An emoji is a variation of the old yellow happy face with an infinite variety of facial expressions. The winner is a round yellow ball laughing so hard it is crying. It is officially called “Tears of Joy.” Clever, no? Basically, Oxford Dictionaries, in an age of amazing technological, medical and scientific progress, chose the first cousin of a hieroglyphic as Word of the Year. I like emojis. I consider them a good safety net for when we are all so mind-numbed that we return to communicating by drawing pictures on the walls of caves. It’s always good to have a backup plan. Or an extra –ism or two.